I know this would set out another fire, though you would surely like to know why this flame of debates about Learning Theory goes out. First, let’s see the differences between Constructivism and Instructivism. Second, the differences between Constructivism and Connectivism. (b) Do social engagement and participation correspond with diversifying a network? If so, how is Constructivism different than Connectivism, and if not, how are these practically different? That’s the authors belief. I see these differently, and that I don’t agree that Connectivism is the Constructivism theory reworked to fit the digital age. It seems to be a matter of interpretation. However, I reckon the authors have made a number of assumptions that were based on “weak grounds”. Though there are overlapping areas in between Connectivism and Constructivism, they are essentially different. (b) provide a context – where Connectivism emphasizes the use of PLE and aggregate-remix-repurpose-feed forward in MOOC (networked learning with navigation and construction of networks), and Constructivism emphasizes on situated learning and COPs. (c) Learning that supports autonomy and relatedness. (e) Both support self-regulated learning – Connectivism stresses on autonomy, diversity, openness and interactivity and connectivity as property of networks. Constructivism stresses on social learning, and must be viewed as an active process where students actively construct their knowledge, and that learner is central to the learning process. – The design process is based on chaos and complexity theory, theory of emergence and self-organisation. Chaos recognizes the connection of everything to everything (Siemens, 2004). Self organization and emergence in learning explains why the process is often “chaotic” and emergent in nature, when interaction among agents leads to connective and emergent learning. – Learning is situated at personal (neuro, conceptual) and social level (outside information sources and agents) and thus is distributed across networks. – Formative evaluation is secondary to learning under Connectivism. Peer evaluation of PLE and artifacts emerged from interaction, conversation and negotiation. What are the common issues for Connectivism and Constructivism? – Assessment based on “pre-determined learning objectives” may be a problem in a constructivist or connectivist learning environment. – Connectivism – which is based on the integration principles explored by chaos, network, complexity and self-organization theory needs further elaboration on how those principles are integrated in practice. It seems a paradox when networked learning is heavily promoted within institutional and corporate education and learning environment, but then the challenges remained un-resolved – on openness – OER, open design, open research, open teaching etc., digital literacy development using social media and mobile technology, pedagogy etc. Currently, there are still too many “wicked problems” – where the problems are not clearly defined, and where risk management and innovation and creativity are at “odds” in a complex adaptive system. – Constructivism – which is based on a social learning approach, encourages active, rather than passive learning and the use of group-based cooperative learning activities, which can be best mediated through telecommunication technologies. “A central strategy for building constructivist learning environment such as situated learning, multiple perspectives and flexible learning is to create a collaborative learning environment”. The reality is that such learning environment often requires students to question each other’s understanding and explain their own perspectives. This is easier said than done. Engagement and participation normally falls into the 1-9-90 or the 10-20-70 pattern, with the majority staying at the edge of Community. This may be due to the different backgrounds and skill levels of learners (i.e. digital literacy capacity), and the often perceived “power” and “group think” issues associated with group learning, with compliance and conformance that could silence the “critical thinkers” and “solo or solitary learners”, or the “dis-allowing” of lurkers or legitimate peripheral learners who often are situated in the networks and COPs. So, in summary, the absence of specific learning objectives and outcomes has earned the “criticism” for constructivism as “inefficient and ineffective”. This may equally be a challenge for Connectivism to be adopted as a mainstream pedagogy. Unless the specific learning objectives and outcomes (based on competency-based learning) are adequately addressed and resolved, it seems both Constructivism and Connectivism would still be operating in a hand-in-hand “networked” informal learning “paradigm” waiting to be absorbed as new and emergent pedagogy. 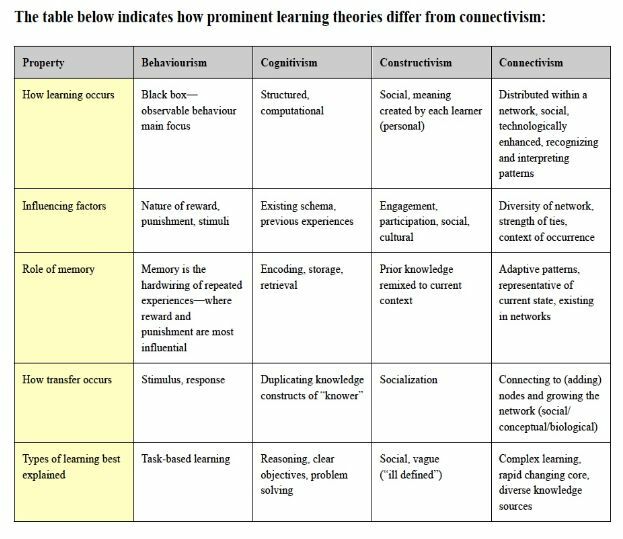 Postscript: This blog provides useful information about Learning Theories – Behaviorism, Cognitivism, Constructivism and Networked Learning. However, there wasn’t any mention about Connectivism. Quite a surprise. I found Jenny’s post thought provoking, and so this is a follow up post on my previous one relating to Connectivism & Constructivism – What’s similar and different. 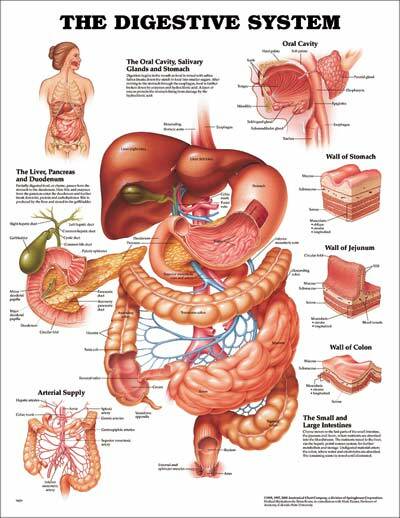 Referring again to the diagram here. What may happen is that social, meaning created by each learner (personal) could actually happen in a distributed network. However, social doesn’t necessarily mean it would be within a virtual or digital space, or network, as it could happen in a space that once conceived to be navigation across networks. Also, in networked learning, “it is not just what we learn, but how we feel about what we learn, which counts in the long term.” So is dancing as a metaphor. It’s the feeling of learning which makes a difference from the traditional education and learning, where group learning is believed to be based on a scientific approach, and individual feelings need to be constrained to avoid intervening the group’s performance. So, it is important to encourage a dynamic between thinking and feeling in order to promote learning more effectively, rather than focusing on critical thinking alone, especially in networked learning. “Learning is an interactive experience best achieved in a climate of relatedness, care and mutual respect. Such care is offered, not imposed, and respects humans’ need for autonomy, self-determination, and challenge as well as security” Rosyln Arnold (2005) (pg 28). This could be crucial to networked learning, especially where humans are interacting with each others in communities of practice. However, there are still paradoxes in between autonomy, diversity, openness and interactivity when educators and learners are immersed in a complex, emergent learning environment (MOOC). 1. How could learning be best achieved under a connectivist environment? 2. What are the pre-requisite literacies and skills for educators and learners to consider in networked learning? I suppose meaning created by each learner (under Constructivism or Social Constructivism) does assume the recognition and interpretation of networks. Teachers and educators should become the source of how to navigate in the ocean of available information and knowledge. We should become coaches and mentors within the knowledge era. Instructional designers should start to design coaching and navigating activitiesinstead of designing learning facilitation and learning activities; to configure navigation tools instead of the re-configuration of content. 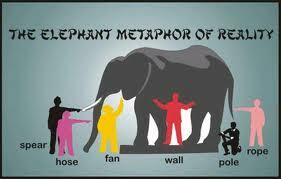 I think this shows that a shift in the frame of reference would change the way we perceive an object’s appearance. Similarly, the recognition and interpretation of the patterns as shown in this simple experiment well illustrates how a shift from Social to Network frame of reference (with neuro, conceptual and social) could make a difference. A constructivist approach involved challenging this deeply set misconception through physically demonstrating that heavy objects do not reach the ground before light objects. I believed that the physical demonstration had the effect of deconstructing the student’s existing thinking and reconstructing it or replacing it with the correct thinking. The concepts that are crystallised through such networked learning may be based on the ability of the learner to recognise and interpret the pattern (i.e. principally on the navigation and exploration, with or without the teachers), rather than the demonstration of the teacher and explanation of the concepts via “Constructivism or Social Constructivism”. This means that the concept development under Connectivism is far more reaching than the typical “classroom” or social networks environment, but would also include technological and media enhancement for its nourishment. This approach may take the form of Create, Interact and Track as discussed in CCK11. 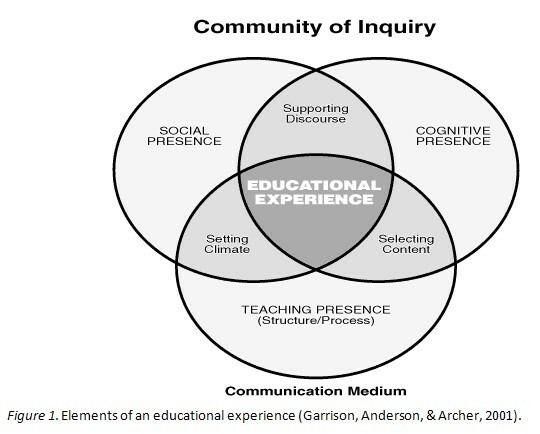 Picture: Garrison, Anderson, & Archer (2001) Elements of an educational experience. How would Connectivism and Constructivism differ in terms of the elements of educational experience? Below is my Part 3 newly introduced in this post. As a transformative learning theory based on affordance and networks. Here I have reflected on how networks and connections are formed socially, most likely as a result of emotions and feelings attuned to the nodes or artifacts. It seems that we need both soft technology and hard technology to allow for the emergence of transformational learning. The cMOOCs seem to be based on soft technology, with Connectivism as the principal model of education and learning. The xMOOCs seem to be based on hard technology, with Instructivism and Mastery Learning as the principal model of education and learning. For the current students, educators (including professors) and participants of xMOOCs, Instructivism and Mastery Learning may still be their favorite way of learning, whereas professors would likely prefer to adopt as a pedagogy. For students and educators (including professors) and participants of cMOOCs, Constructivism and Connectivism would be their favorite way of learning, whereas all involved in the cMOOCs would like to experiment beyond the box, the four walls of institutions, and “test” the limits in terms of constraints imposed by the formal curriculum with stipulated timelines, set course structure with definitive and prescriptive learning outcomes, and routine video lectures of a didactic nature of teaching. My verdict is: Behaviorism and Cognitivism would still ring supreme in xMOOCs, and it is not likely that these “massive” cohort of xMOOC students, professors would prefer the Connectivist or Constructivist approaches towards learning. These may change upon time, as more and more learners and educators realize the need of adaptation and enormous changes that are required in order to survive and thrive in a highly complex education ecology. What are missing in MOOC research? MOOC is here to stay! Good reflection on MOOCs. How about research into MOOCs? There are missing elements – learners’ needs (and motivation), pedagogy (from both teachers and learners’ perspectives) and openness which seems fundamental and universal in most Higher Education system, but not thoroughly addressed, as most posts published in those newspapers have been written from the perspectives of news reporters, senior executives or CEO, professors, administrators and researchers, but not much by teachers and learners. As I shared in my posts, the learners’ needs may be segmented in accordance to a few categories – (a) those who are in high school, but would like to advance their knowledge or have some remedial knowledge through KA or preliminary courses in university, (b) those who are looking for university or degree education, (c) those who are graduates, and would like to use MOOC to further their professional development, and (d) those who are interested in life-long and continuing education, and (e) those who are retired or just have an interest in the course (MOOC). Such diverse needs would also require different pedagogies – instructivist approach for those novice of (a), (b), a mix of social constructivist and or connectivist approaches for (c), (d) and (e). Openness could be difficult to define, though would likely be based on individual’s preference. Unfortunately, there aren’t much research findings (from xMOOCs) published on these areas, leading to lots of posts basing only on expert’s knowledge and experience, but not much on empirical and statistical findings as evidences to support those assertions and assumptions. I did researches on cMOOCs and published findings based on empirical data, rather than the mere use of blog posts or basic statistics as reported in blogs. It seems that without those empirical data, we are just best speculating on the trend, but that these are not yet fully reflective of the “reality”. Besides, if we are to ask people what serves them best, they would likely tell you what is available now for free (like instructivist approach) where the instructors might have curated all information, taught what is required for the quizzes, assignments, and examination, leaving the learners to consume what is presented. This would surely satisfy the requirements for the course, from an institutional perspective, and all auditors’ requirements. However, that would only cover the procedural knowledge and at best declarative knowledge which is known and could be tested and assessed by automated system. There is not much emphasis on generative and creative knowledge, as they are not tested or assessed (or cannot be assessed), and there aren’t much progress in this area, simply because social constructivism and connectivism may only be given a light touch in those MOOCs, where the professors have no time to interact or connect with each of the participants (i.e. it is impossible with tens of thousands of students). This is again based on the assumptions that learners would learn better using different pedagogies which may only be valid with empirical findings and validation. A well presented video on Social Learning Theories – Constructivism and Connectivism. I have compared the similarities and differences of Constructivism and Connectivism here. While rhizomes are diverse in shape and structure – growing, adapting, sprouting, replicating – they are not diverse in substance – i.e. rhizomes do not morph into new organic entities. In his edtechweekly podcast, Cormier criticizes networks as being “duplicatable”. If someone has a successful network, she is tempted to say “this is how you create your own network”. Suddenly, the network becomes mechanistic. Cormier doesn’t like that. Neither do I. However, networks need not be designed in order to duplicate structure. Networks are organic – consider food webs, ecosystems, and the architecture of the brain. I don’t accept the argument that rhizomes are organic and that networks are not. The central arguments about rhizomes and networks would be essential, as they could lead us to better understanding on how networks are situated. I found networks could both be mechanically or artificially constructed and organically grown. The network structure of neurons connections in our brain is organic. Networks could be artificially constructed, like the networks and communities that are “built” and constructed, by each of the human agents, together with non-human agents which include the media, tools etc. Networks could also be internally grown and developed, such as those in our human brain, or those inside our body, with blood streams, artery and veins, though these are likely under the control of the individuals. The influence or changes due to the external networks on our brain network would account for the emotional responses, a change in the memory (of remembering facts, events and experience), or a change in the cognitive abilities in recognition of pattern, connections of concepts, thus re-wiring the connections and circuits. What are the educational implications of social learning theories? That will take another post for the exploration and reflection. Is lecturing the cream of teaching, at the mercy of learning? Photo: Credit from anonymous source. 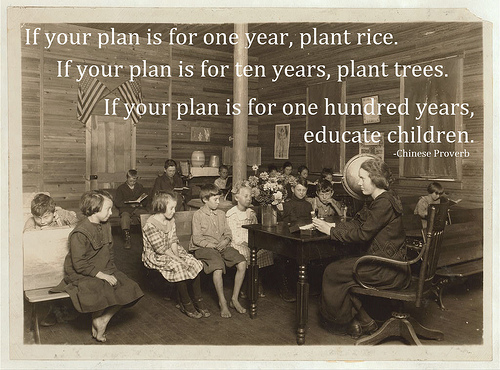 Lecturing is the win-win-win solution in teaching, from last century till this decade, right? May be it is still a predominant way of disseminating information from the lecturer to students, be it a video lecture like Khan Academy or the mass video lectures throughout the Education Video series on Youtube Education. Relating to the use of videos in higher education, certain trends are clear, where video production and consumption rate are exploding. Every minute, approximately 13 hours of video are uploaded to Youtube. University lectures on Youtube are exploding at an exponential rate too, though it is still not yet fully known on their use as an OER among students, except by checking on the number of hits on those lecture videos. Besides, there are education videos on TED.COM that is competing for the attention of general public, educators and learners. Mass lecturing or classroom based lecturing is still the holy grail that would last for another decade. Is it any wonder students want Powerpoint slides of their lectures? They know that there is a world of knowledge available to them on any given subject. They also know that they will be tested on some of this information. Why not demand that the lecturer condense, organise, and present the information that is considered most important – saves the student from having to do it themselves. Not a surprise, aha! Lecturers teaching in accordance to what is required in the course curriculum, and ensure the learning outcomes are met, through exposition of the deep-down-to earth content, case-by-case, point-by-point, and checking whether the students comprehend what has been taught through quizzes, tests, and examinations. Isn’t it what the administrators want to achieve, in terms of making sure the lecturers are satisfying the students’ needs and expectations, in providing a summary of learning, the cream of knowledge and wisdom. This would make sure that the students would conform with the requirements set by the potential employers in future work, as these students are accredited with a degree of excellence in achievement and are ready for employment. 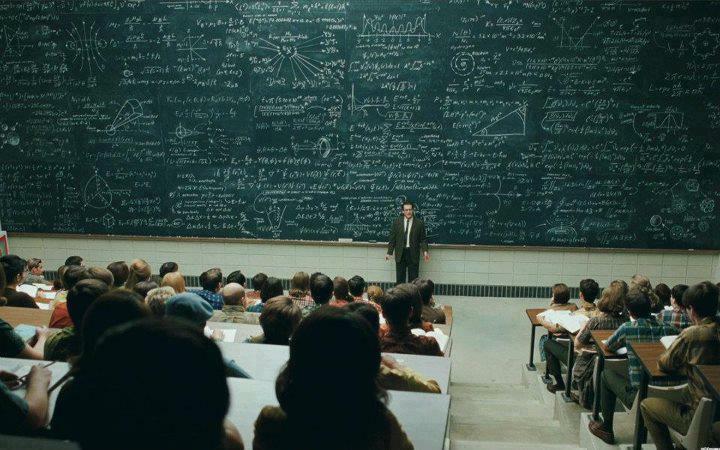 Lecturing is easy to do. In one hour (or 90 minutes or whatever) you can deal with 40, 50 100, 200 or 1000 students. In and out with minimal effort (plus the accompanying buzz). In addition, lectures are sustainable – easily recycled and reused. They are an easy way to teach. I am not sure that there is much interaction in most lectures anyway. Moreover, I think Gen Y and their kids will consider 400 students in a lecture hall an anachronism. I wonder whether they will be able to concentrate for more than five minutes in a row. Electronic interactions through small groups will be the absolute norm. Students will like it; financial administrators will like it. I think Chris’s assertion of using electronic interactions with small groups would be significantly better than the mass lecture, as I have shared also in my past post of to teach or not to teach, to learn or not to learn. Instead of mass lecturing, what are some of the options? 1. In University 2.0 Sebastian Thrun envisions the use of tools and technology in reaching hundreds of thousand of students throughout the world, with small video clips of short duration to provide snapshots of knowledge, just like what Salman Khan has been doing. The use of practice and quiz may be a good way to check one’s understanding of basic knowledge. 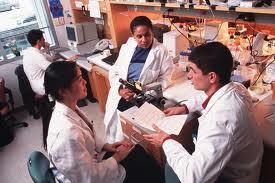 However, when it comes to higher order learning, then such practice and quiz is not sufficient. This is a constructivist approach towards learning, apart from the instructivist approach to learning. 2. A MOOC, Mobile MOOC or MOON approach to articulate and integrate the learning – both institutional and personal learning. This is based on a Connectivist approach to learning, though at times fused with the COPs, Situated Learning, Rhizomatic learning, and Constructivist Learning throughout the networks and communities, with individuals building their PLE/PLN. 3. What about other options? I have shared some of the future learning here. What may be underpinning theories behind all these “exciting present and future scenarios”? How about Netagogy? Here Terry summarises some of the recent distance education theories. Postscript: Refer to this post on university-lectures-are-a-legacy-of-our-predigital-past. 12 July 2012. Another nice post on who-would-choose-a-lecture-as-their-primary-mode-of-learning. 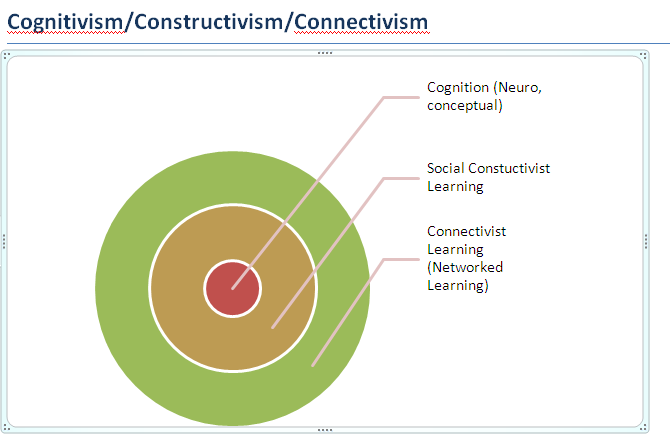 #Change11 #CCK12 What is common in Connectivism, Constructivism and Constructionism? What is common about Connectivism, Constructivism and Constructionism? Connectivism: One aspect of connectivism is the use of a network with nodes and connections as a central metaphor for learning. In this metaphor, a node is anything that can be connected to another node within a network such as an organisation: information, data, feelings, images. Connectivism sees learning as the process of creating connections and developing a network. Constructivism: through processes of accommodation and assimilation, individuals construct new knowledge from their experiences. Constructionism: learning can happen most effectively when people are also active in making tangible objects in the real world. Learning is most effective when part of an activity the learner experiences as constructing a meaningful product. Connectivism – focus on networks, among entities. Constructivism – focus on knowledge from experiences & interaction, individually, and socially. Constructionism – focus on the construction of meaningful product, knowledge in one’s mind. Connectivism – creation of an environment, with individuals creating artifacts, through curation of ideas, posts, mixing, repurposing, re-designing and developing, and posting of artifacts, with sensemaking, where people make sense of the experience in the world, and wayfinding. 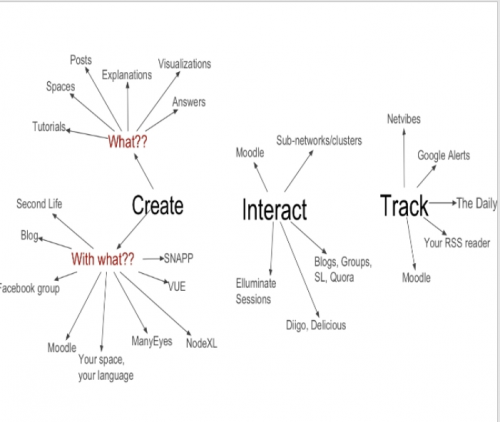 In a MOOC environment, the CDE – chaotic, distributed, and emergent learning. See this research by Kop, Fournier and Mak (2011), for details. Constructivism – creation of conversation, and interaction. Constructionism – creation of meaningful objects or products. All theories would be explored through the curation and examination of ideas, development of concepts, connection of concepts in ones mind (the cognition) and with other people, individual reflection of ideas and concepts based on metacognition (thinking how to think), experimentation of networks and communities, through research, discourse, and critical inquiry. So, theories provide their own lens into the world, with each theory providing a different lens (or perspective) (Kuhn, 1970). I found it interesting to explore with the different MOOCs. Teachers and educators should become the source of how to navigate in the ocean of available information and knowledge. We should become coaches and mentors within the knowledge era. Instructional designers should start to design coaching and navigating activities instead of designing learning facilitation and learning activities; to configure navigation tools instead of the re-configuration of content. Would explore this in Part 3. #Change11 Connectivism and Constructivism – What’s similar and different?